A mosque (masjid in Arabic) is a place of worship in Islam. Although prayers can be said privately, either indoors or outdoors, nearly every community of Muslims dedicates a space or building for congregational prayer. The main architectural components of a mosque are practical in purpose and provide both continuity and a sense of tradition among Muslims worldwide. 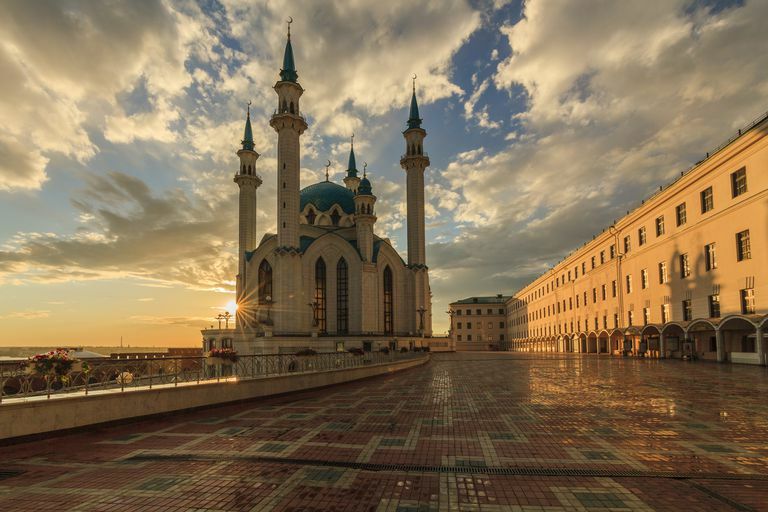 There is a great deal of variation among mosques around the world. Building materials and design depend on the culture, heritage, and resources of each local Muslim community. However, there are a number of features that nearly all mosques have in common. A minaret is a slim tower with balconies or open galleries from which a mosque's muezzin calls the faithful to prayer five times each day. Minarets are distinctive traditional features of many mosques, though they vary in height, style, and number. Minarets may be square, round, hexagonal, octagonal, or even spiral and they are usually covered with a pointed roof. The word minaret derives from the Arabic word for "lighthouse" or "beacon." Many mosques are decorated with a dome rooftop, particularly in the Middle East. In some traditions, the dome symbolizes the vault of heaven. The interior of a dome is usually highly decorated with floral, geometric and other patterns. The main dome of a mosque usually covers the main prayer hall of the structure. Some mosques may have secondary domes, as well. Inside, the central area for prayer is called a musalla (literally, "place for prayer"). It is deliberately left quite bare. No furniture is needed, as worshippers sit, kneel, and bow directly on the floor. There may be a few chairs or benches to assist elderly or disabled worshippers who have difficulty with mobility. Along the walls and pillars of the prayer hall, there are usually bookshelves to hold copies of the Qur'an, wooden book stands (rihal), other religious reading material, and individual prayer rugs. Beyond this, the prayer hall is otherwise a large, open space. The mihrab is an ornamental, semi-circular indentation in the wall of the prayer room of a mosque that marks the direction of the qiblah—the direction facing Mecca which Muslims face during prayer. Mihrabs vary in size and color, but they are usually shaped like a doorway and decorated with mosaic tiles and calligraphy to make space stand out. The minbar is a raised platform in the front area of a mosque prayer hall, from which sermons or speeches are given. The minbar is usually made of carved wood, stone, or brick. It includes a short staircase leading to the top platform, which is sometimes covered by a small dome. Ablutions (ritual washing or wudu) are part of the preparation for Muslim prayer. Sometimes a space for ablutions is set aside in a restroom or washroom. Alternatively, there may be a fountain-like structure along a wall or in a courtyard. Running water is available, often with small stools or seats to make it easier to sit down to wash the feet. During Islamic prayers, worshippers bow, kneel, and prostrate on the ground in humility before God. The only requirement in Islam is that prayers be performed in an area that is clean. Rugs and carpets have become a traditional way to ensure the cleanliness of the place of prayer, and to provide some cushioning on the floor. Traditional prayer rugs include an arch-shaped symbol at one end. This symbol represents the mihrab and must point toward Mecca during prayer. In mosques, the prayer area is often covered with large prayer carpets. Smaller prayer rugs may be stacked on a nearby shelf for individual use. The shoe shelf is a practical feature of many mosques worldwide. Muslims remove their shoes before entering a mosque in order to preserve the cleanliness of the prayer space. Rather than dumping piles of shoes near the door, shelves are strategically placed near mosque entrances so that visitors can neatly organize, and later find their shoes.